Trying to install kali linux or ubuntu on Oracle VirtualBox or VMware ? but when running the virtual machine you got this message " This kernel requires an x86-64 CPU, but only detected an i686 CPU. 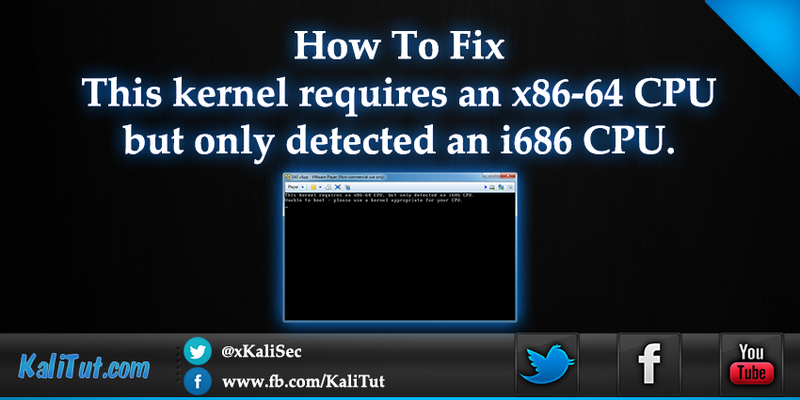 Unable to boot – please use a kernel appropriate for your CPU ". Power on your computer and open the BIOS by pressing the delete key or F1 key or F2 or Alt and F4 keys it depend on the system you have. Open the Processor submenu The processor settings menu may be in the Chipset, Advanced CPU Configuration or Northbridge. but if you still want to run a 64bit guest over an 32bit host, you can do that by enabling Virtualization option or Vtx/X option. if you are trying to install a 32bit guest system then chose 32bit and if you are trying to install 64-bit guest system chose 64-bit . To be able to run a 64-bit OS in Virtualbox we have to make sure the virtual machine's architecture is set to 64-bit too. what is Virtualization Technology anyway ? Virtualization Technology (VT) enables a CPU to act as if you have several independent computers, to enable several operating systems to run at the same time on the same machine. How to check if Virtualization Technology (vt-x/amd-v) is Enabled ? how many rams are you giving to the Guest OS ? 4) Click on the Customize Hardware button. do you have Oracle VM VirtualBox or vmware ? if you dont have Oracle VM VirtualBox , then download it for free from https://www.virtualbox.org and setup it , then try to start genymotion from android studio ... waiting to hear from you ! the last day it was working what did you install ? did you update your host OS ? did you install any new software ? The feature you are trying to use is on a network resourse that is unavailable. the installation package "VirtualBox-5.0.26-r108824-MultiArch_x86.msi" in the box below. and I got it the file is missing...so what to do now? I am having in my system N3710 but EUFI is not showing this option in the bios. My windows 10 is 64 bit only. in vurtual box .it shows unable to boot - kernal......... also check in virtual box enablw peX..